During a week painting and drawing in a beautiful place in the south of France, without a teacher, so in perfect freedom: landscape, still life, model or whatever you like: you can do it at Le Colombier in Espenel ( departement Drôme, just north of the Provence). Le Colombier is an estate, situated 800 m from the village Espenel, consisting of an ancient farm, an apartment and a house on a terrain of ca 48 ha with a vineyard, lavenderfields, meadows and forest. You can stay in this house and apartment, and at night you enjoy a nice dinner. 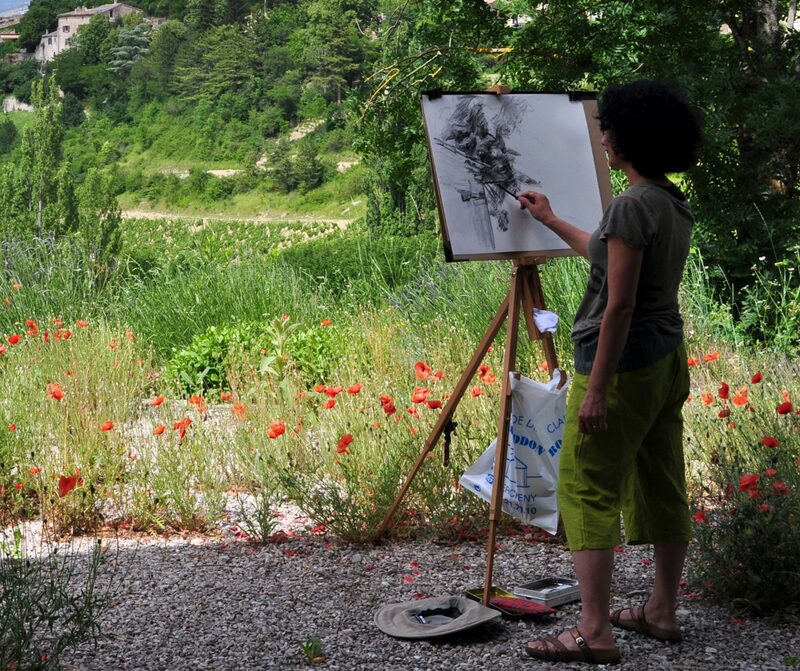 Surrounded by vineyards, mountains and untouched nature you can settle anywhere in order to paint or draw. There are spectacular views all around – therefore an ideal spot for landscape painting. In case of bad weather ( which is quite rare in summer) you can use my studio. Here you can also do model painting. There is no teacher telling you what to do: you are perfectly free in your artistic activity. The group will consist of 6 to 8 persons. Of course there is the possibility to see and discuss each others work: this can be very inspiring. And if you want to do something else: the surroundings offer all kinds of possibilities.